[pull_quote_right]Yeah it was a pretty scary situation my freshman year. I didn't know what was going on. It came really quick, you know. 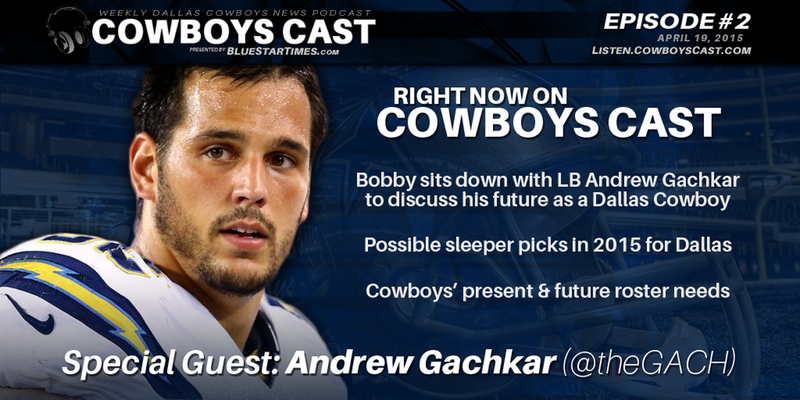 [/pull_quote_right]On April 19, 2015, recently signed linebacker of the Dallas Cowboys, Andrew Gachkar sat down with Bobby, Jared and Josh on Cowboys Cast to talk a little about his life before signing with Dallas and his role moving forward. Bobby (@SportsByDallas): Andrew, How are you doing, man? Andrew (@theGACH): I'm doing good. I'm having a good Sunday, and I'm on my way back down to Dallas right now to get started for the first day of me being a Cowboy. Bobby (@SportsByDallas): Wow, that's great. So you're coming from San Diego and this is I think the most crucial question to see how Cowboys Nation receives you. So coming from San Diego, into Dallas, Whataburger or In-N-Out? Andrew (@theGACH): You know what? I have tweeted about Whataburger, and I do like Whataburger, but I also like In-N-Out. But I honestly would choose Smash Burger. Bobby (@SportsByDallas): Oh! There you go. Smash Burger's a good call. We've got former Cowboys running a bunch of those franchises out here, actually. Leonard Davis, Colombo and a couple of other guys. So let's jump right into this. In the discussions you had with the team leading up to this point, what's your understanding of your role heading into this season? You know, from your time in San Diego you had special teams proficiency, but are you coming in here looking to fight for one of the starting linebacker spots or what's your understanding of what's coming into 2015? Andrew (@theGACH): Oh, absolutely! I did a good job playing linebacker last year and speaking with the team, I think my role is definitely to find my niche in the linebacking core. They're gonna give me, I'm sure, every opportunity to try and fight for a starting role. Where that is, I'm not sure yet. 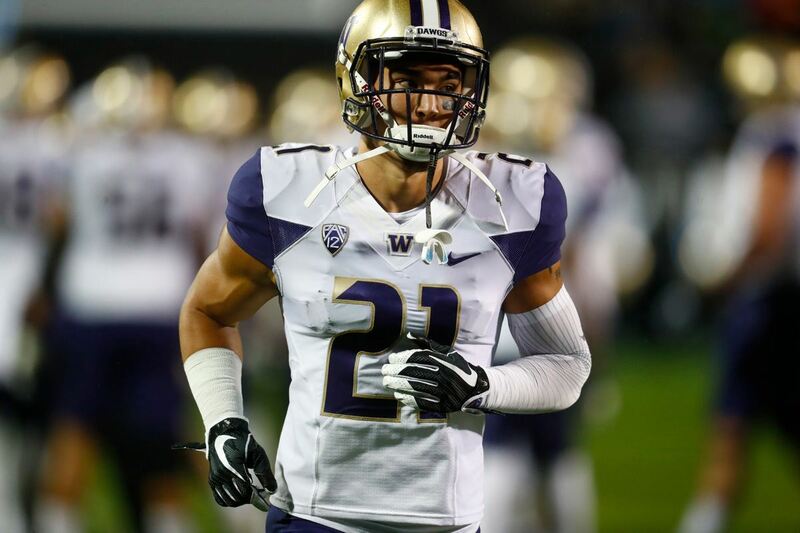 Obviously, with Rich Bisaccia I definitely have a role in the special teams game and that's kind of where I started my NFL career off but, definitely I'm gonna be fighting for a starting role on defense. If not there then maybe a nickel situation like I was with the Chargers. Wherever I can find my spot is where I want to help the team, honestly. That's really the main goal is giving the team exactly what my best abilities are to help them win. 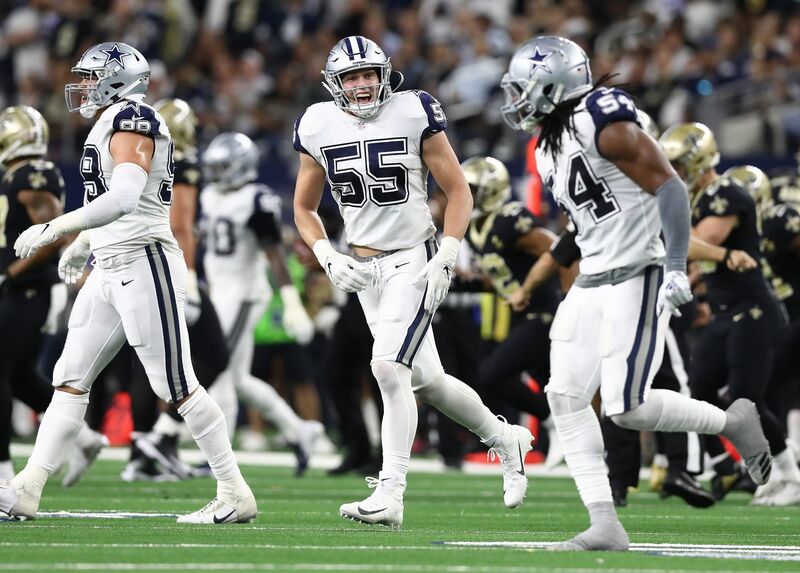 Josh (@JoshWingate_302): Let's say May 1, Dallas is looking at a second round, and they pick a linebacker the first round, does that change your mentality for the 2015/2016 seasons? Andrew (@theGACH): It doesn't change my mentality at all. I mean, you come in prepared, you know. Rookies aren't always ready to play or an injury happens here and the entire season completely changes, you know what I mean? So, I'll always be prepared. I mean that's always been my role the last four years. Just be prepared, be ready. That's what happened to me last year. We got to about game three and then from then on I played the entire season. So, however it works out, it works out. I'm just excited for the opportunity to be a Dallas Cowboy, and I keep getting better at my position and I'm excited to show the fans exactly how I can play. Jared (@Jared_Katz30): Hey Gach. So we know that Dallas jumped on you fairly quickly in free agency so did you really get a chance to talk with any other teams, or were you looking to come to Dallas right away? What was that whole process like for you? Andrew (@theGACH): I think me and my wife knew in the beginning that Dallas was definitely going to be one of the areas we wanted to go to. We definitely had five or six other teams that would like me there. It came down basically in the end to New England and Dallas and with the same offers on the table, we really felt like Dallas was gonna be a good fit for us. My wife being from Dallas and a couple of coaches on the staff and already knowing them; It was really gonna be a good fit for me. 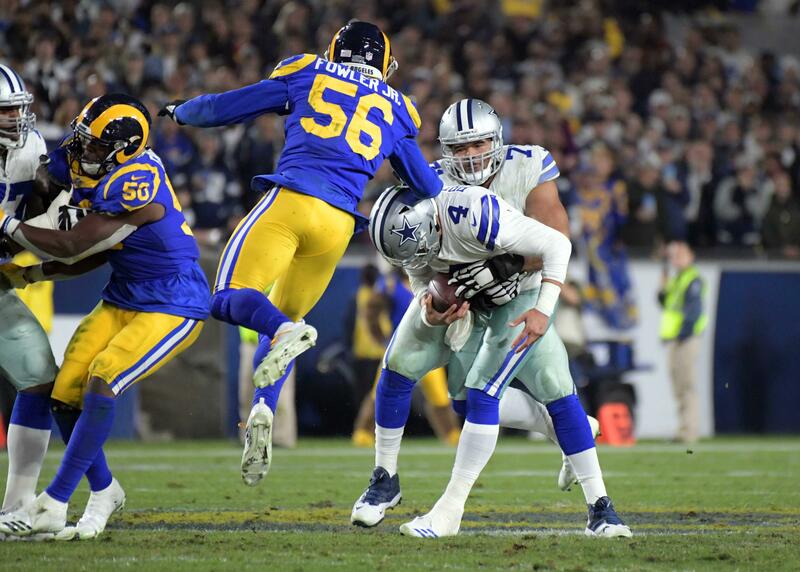 Bobby (@SportsByDallas): Now there is one thing that Cowboys fans already, without having seen you play a snap with a star on your helmet yet, there's one thing Cowboys fans can know for sure about you Andrew, and that's you're one tough son of a gun. Alright, it takes real toughness to play on a special teams unit to begin with, but it's also pretty incredible that you managed to continue your football career after a pretty serious health scare your freshman year at Missouri. Can you talk about what happened there and your process of recovery just to get back to playing football at Missouri, much less make it to the NFL? Andrew (@theGACH): Yeah it was a pretty scary situation my freshman year. I didn't know what was going on. It came really quick, you know. I was playing some basketball one day and I just, later that afternoon I'm in the hospital for a good month after that and had a bunch of surgeries and it wasn't fun. Coaches seeing me afterwards, being like 180lbs, not ever thinking I'd... Not playing football was in the question. We had no idea. So it was definitely a life changing experience but then I actually came back later that year - probably six months later - and it wasn't the season I exactly wanted, you know. But I eventually got over it and moved on from the situation. Josh (@JoshWingate_302): I heard you have a newborn and how much Red Bull are you drinking so far? Bobby (@SportsByDallas): You're a lucky man, Andrew. Andrew (@theGACH): I'm pretty lucky. Yeah, I think we are. Jared (@Jared_Katz30): Obviously we have to ask you the big draft question: who would you take first overall between Jameis Winston and Marcus Mariota, if you were the Buccaneers? Andrew (@theGACH): I guess if I'm the Bucs, I'd probably take Jameis Winston. But I guess I can't say that I'm too convinced on that. I'm not a draft expert or anything like that but if I had to say, he's probably the most pro-ready looking quarterback out of them. But I'm not sure how ready quarterbacks are coming out of college anyway, so good luck to them, I guess. I don't really know. Bobby (@SportsByDallas): Well here, let's jump on something a little bit different. I know just from checking your Twitter and following you on there, and for those of you who want to go follow him it's @theGACH - I know from following you there, you seem to be a pretty big avid TV watcher during the offseason. So what are you and the wife watching right now? Andrew (@theGACH): Yeah, we are. We've been keeping up all of our... I mean, every show we watch usually is on Netflix. Couple of weeks ago we finished out the (House of) Cards season and we keep up with our Scandal every episode. Now we're just starting the Game of Thrones back up. We're big fans of Homeland too. Bobby (@SportsByDallas): Did you ever get to finish The Blacklist because I saw you had started watching that? Andrew (@theGACH): Not this season, no. We kind of put that on hold because we're moving and stuff. Jared (@Jared_Katz30): I just started watching The Blacklist and that show is amazing! Bobby (@SportsByDallas): Yeah. You got James Spader. He's the man there. What's your game day playlist sound like, Andrew; what do you listen to to get pumped up before a game? Andrew (@theGACH): I'm a little weird, I guess. I don't listen to that much music before games. I'm more of a levity guy. I'm telling jokes and stuff in the locker room and I'm keeping it real light. That's kind of how I am. I used to - back in high school - be banging my head against lockers listening to music and stuff but then I figure, you know what? You're just wasting energy. Just save it for the game. Bobby (@SportsByDallas): So then I guess it's just the thought of being able to throw Eli Manning to the ground that's enough to get you pumped up? You don't need to worry about music. Bobby (@SportsByDallas): Hey, well that'll fit here, man. Josh (@JoshWingate_302): What kind of music do you listen to, as far as country... who's your artist right now? Andrew (@theGACH): Well I got Florida Georgia Line on in the car right now. Well, it's kind of on silent but I'm more of a today's country kind of thing. My wife turned me on to it about ten years ago anyways. But yeah, I like Blake Shelton and stuff like that. Bobby (@SportsByDallas): You sound like you got a great wife, man. She's from Dallas. She's getting you turned on to the right music already. I think you've got a keeper there. Andrew (@theGACH): Oh yeah, she's pretty special. Bobby (@SportsByDallas): Andrew, we've just about got a few seconds left here, but I know everybody in Dallas is really excited to have you here. We've all kind of been checking out the game film, we've seen you shoot that gap and get past the guards. So I know we're all excited to see what you can do on the football field. But best of luck this season and here's to Super Bowl number six. Andrew (@theGACH): I appreciate you guys having me on. I'm excited. Here at BlueStarTimes.com & @CowboysNation, we're all really grateful that Andrew took a few minutes during his drive to chat with us. We wish him and his family all the best. Be sure to follow Andrew Gachkar on Twitter at @theGACH and give him a warm welcome to Dallas!